The H series granulators offer a wide array of different rotor designs. Their completely welded heavy steel construction is designed to withstand the most demanding and universal applications. Rotor bearings, knife mounts and rotor shaft are oversized. The standard V-cut creates a high quality regrind with a very low percentage of fines in the output material. The removable third stator blade is acting as a deflector wedge and allows the machine to be quickly adjusted to different application scenarios. Other standard features include easily replaceable wear plates in the cutting chamber as well as outboard bearings reducing the risk of contamination. The wide range of rotors and hopper styles allow the H machines to be tailored to almost every application in the recycling field. The H 35, 50, 60 and 70 granulators are mainly used as central granulators for in house recycling applications to process thick walled pieces in one step. The H 110 series can be used to grind large thick walled parts down to a granule in one step. The large diameter rotors are available with a choice of 9, 11 or 13 rows of rotor knives. 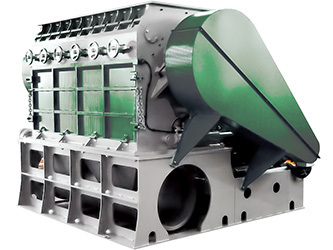 The V-cut design ensures a high quality granule with a low percentage of fines. All of the H granulators can be used as a second step granulator after a P shredder to reach higher throughput rates. When used to grind light materials, such as bottles the throughput can be greatly increased with the addition of a Virtus Equipment force feeding device. For abrasive, contaminated or highly-filled materials the machines can be equipped with special wear protection, such as hard facing of the rotor and housing and key parts manufactured from highly wear resistant steels. The easily removable deflector wedge acts as a third stator blade and can be used to adjust the aggressiveness of the rotor at the first cutting point. Rotor and stator knives are pre-set outside the granulator in a supplied bench-top fixture prior to installation. Awkward adjustments inside the machine are no longer necessary. The H granulators are available with different rotor options to fit different applications, for example with oversized suction troughs in order to achieve a very high output. All rotors feature the V-cut technology creating a high quality regrind. The H 110 series comes standard with wide H-style rotors available with 9, 11 or 13 rows of rotor blades ensuring a high quality output. The heavy-duty bearings are separated from the cutting chamber to avoid lubricants entering the cutting chamber and bearing failure due to material contamination in the bearings. For abrasive applications the H granulators can be equipped with rotors with key parts manufactured from highly wear resistant steel as well as weld on hard facing.